Within the past 48 hours, as gold and silver have broken to new highs (ignoring inflation), there are some indications that demand for physical precious metals may be on the rise. My company does not deal with the customers who make purchases of tens to hundreds of millions of dollars at a time. Such buyers normally deal direct with the major brokers in London or New York. Instead, our median purchaser of gold and silver bullion-priced products probably spends less than $5,000 per transaction. We do have a number of customers who regularly spend five or six figures and the occasional seven figure deal, but my company’s total volume is unimportant when compared to total global precious metals trading. Still, we are in constant communication with several primary distributors of products for the US Mint and other world mints that issue bullion products. 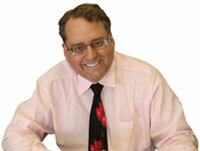 We also keep in touch with a number of other wholesalers across the country. If there is a change in product availability or price level, we learn about it quickly. Today my company enjoyed one of its five highest retail sales days of the past 30 years. As we were contacting wholesalers to replenish our inventories, we picked up what may be significant indicators that a supply squeeze of physical gold and silver could be heating up. Three different wholesalers who are primary distributors for the US Mint told us that they have experienced a sharp increase in demand for physical silver coins and ingots in the past 48 hours. When we tried to purchase a quantity of South Africa 1 Ounce Gold Krugerrands, we were also in for a shock. Yesterday, these coins were available pretty much everywhere, with wholesalers competing to sharpen their pencils to shave their ask price. Today, two of the wholesalers were completely out of Krugerrands for live delivery. Our cost to purchase these coins increased almost 0.5% more above the gold value than they did just the day before! One more indicator of a potential supply squeeze is the “spot” price quoted by wholesalers. For protection in volatile markets, wholesalers often use two different spot prices, depending on whether they are buying or selling. For our last large silver order today, the distributor used an ask silver spot price that was eight cents higher than its bid spot price. Previously this company had used the same spot price for both buying and selling or had a maximum spread of just four cents for silver. Our suddenly zooming retail demand and reports that this may be happening across the country, if it continues for a few more days, could spark another buying frenzy such as we experienced in late 2008. Two years ago, availability was so tight that it was not unusual for customers to have to wait at least a month after making payment to receive their merchandise. In 2008, premiums soared for just about any live physical gold and silver. 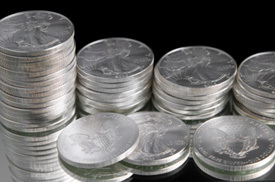 At the peak, bags of US 90% Silver Coins were selling retail for about 40% above their intrinsic metal value! Along with my expectations of higher gold and silver prices, I have also predicted that supplies of physical metals would dry up. This may be now occurring. However, we cannot be sure until we see the pattern continue for another couple of days. Should this pattern continue through next Tuesday afternoon, I would recommend not waiting any longer to establish your position in precious metals. To be extra safe, you may now want to wait even that long. If 1 million Americans buy 1 oz of silver either online or from a local coin dealer, that is 1 million oz of silver depleting the Gold Cartel’s hand. If this were done every Thursday or Friday for a month, that would be 4-5 million oz depleted out of the Cartel’s ammo…. would that send a message to anyone? Better yet, would that reduce gradually the price fixing ability of the FED and the COMEX? Better buy coins with low mintage instead of Gold and Silver Bullion Coins. If coins with low mintage has more chance of value to rise. So gold coins with mintage of 1000 or less or silver coins with mintage of 5000 or less is more desirable for investors! Koichi Ito: If you can buy them for the same price as bullion coins, otherwise I wouldn’t bother with “low mintage coins”. But if you own ANY 1996 Silver Eagles, they are already 2x the price of any other year minted, because so few were minted that year. I just bought a 96 proof, in its GSA box with COA. I’ve been buying Carson City Morgans lately, and those are always good for their collector value, even when REALLY crappy. Collector value should not be confused with Bullion value. Low mintage figures won’t mean much to anyone when you are starving and want to buy bread. I’m of the opinion that buying any coins for the collector value right now would be a mistake. Maximize your holdings by spending as little as possible in premiums and use those savings to buy more silver. We are talking physical silver here, not those ETFs. Those are for the birds. I know a coin dealer here in WA state who can’t give away PCGS graded Morgans. Apparently they were worth hundreds just years ago and now he sells ’em for thirty to thirty five dollars a pop. And these are nice Morgans, 63 to 65s, some PLs. I won’t buy ’em though. Like I said, save those premiums. The point I’m trying to make here is this; Don’t get caught with your pants down. Silver is going to keep rising and I wouldn’t be surprised to see 25 an ounce by Dec. Don’t waste your money on ‘collector value’ gambles. Protect yourselves and maximize the amount, in ounces, that you hold in physical silver. Buying coins with collector value is just about a game over. Folks are about to find out the high priced numismatic coins they bought as an investment is money that would have been better spent on bullion coins and food storage. During the economic collapse of Argentina, gold and silver prices were determined by the scrap value of the metal, not it’s pretty design. can’t give them away, basically.